Lionel Messi Retirement: The forward for two of the best teams in the world, Argentina national and Barcelona team has indicated that he is going to retire. 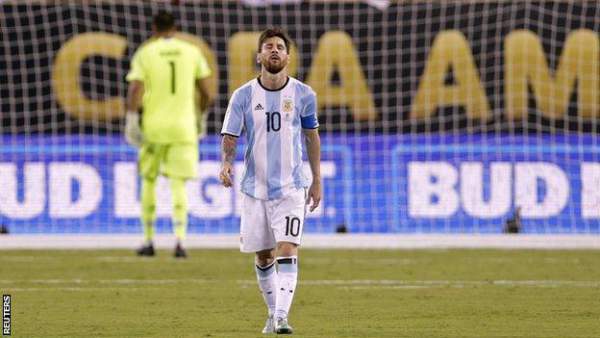 He appeared to be devastated when Argentina lost to Chile in the Copa America 2016 final. “For me, the national team is over. I’ve done all I can; it hurts not to be a champion,” Messi told TRT. His match against Chile was the 112th game for the team. He debuted in 2005. Neither of the two teams was able to score a single goal in the final match of the 2016 CA football tournament in 120 minutes. However, Chile won the match by 4-2 penalties, and this becomes their second consecutive title. Messi hasn’t been honored major international honor other than a gold medal at the 2008 Beijing Olympics. Argentina lost to Chile by 1-0 in the 2014 world cup final. And including this year’s title, Argentina has lost three Copa America finals in the year 2007, 2015, 2016. The penalty was the first opportunity which Argentina couldn’t make use of it. The shootout ballooned too high. Stay tuned to The Reporter Times for latest sports news and celebs’ updates. Don’t forget to share it on social media sites and let others also know. What are your views and thoughts? Do you want Lionel to retire? Next articleGame Of Thrones Season 6 Episode 10 Watch Online: GOT S6E10 Spoilers & Finale Recap for ‘The Winds of The Winter’; Is Catelyn Stark’s Reincarnation True?